The National Trust has today announced that they have taken over the last remaining independently-owned high street business in the UK. 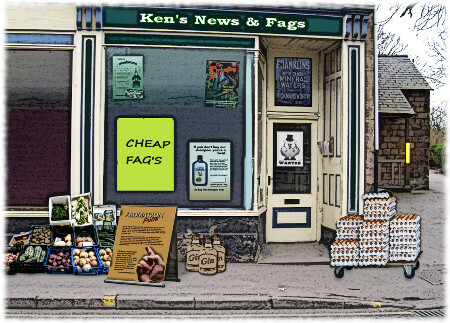 The shop, Ken's News and Fags, a newsagent's and minimart in Dudley, has been in slow decline for some years and was facing closure following a lengthy Trading Standards investigation into the supply of counterfeit detergents, deodorants and other household products. Its owner, Fat Ken Sparks, had defended himself by claiming that the so-called 'fake' goods were not being passed off as the genuine article but were in fact being openly sold as 'tributes' to the real brands. This explanation did not wash. Neither, for that matter, did his phony washing powder, which may well have been responsible for an outbreak of skin complaints in the area. Faced with the prospect of a massive fine, Fat Ken announced that the time had come to finally hang up his pricing gun, a decision which caused much consternation in the area and even made page six of the local paper, just next to an article about dog mess in the memorial gardens and beneath a picture of a shifty-looking resident pointing at a pothole. Where else would people go for odd tasting milk and out-of-date sandwiches? Where would the local school kids buy their fags, knocked off DVDs and mucky magazines? Where else can you find a diary in April? Concerns were also raised at a meeting of the town council, during which councillors discussed the potential impact of the redundancies that would follow the closure. These would not be significant in number - just two: the weird gap-toothed woman with the mad hair who works afternoons, plus the gormless lad who delivers the papers - but all were agreed that nobody wanted these people wandering around with time on their hands. It therefore came as a great relief to everyone when the National Trust stepped in with an offer to take over the business. As an example of a shoddily run local retail outlet, operating on the frontier of legality and with a casual old-fashioned attitude to health and safety which is rarely seen in today's increasingly litigious world, it stands as a sole surviving example of a world gone by. "But what really attracted us was Fat Ken Sparks himself," said a National Trust spokesman. "We rarely come across proprietors like this who are still in working condition and it's unusual to find examples who are quite as vile, disgusting and objectionable as Ken. I'm glad that we are able to preserve him for posterity so that he can be enjoyed by future generations." Prof Moonbeam invents new kind of fan. Team bonding, goal setting, table top brainstorming.